Some of the audience was taken aback and saw the value of really exploring the details of what specific ad the customer saw when they called in. So consider asking the question in the 3 different ways above. Before we explain what else you need to do let’s talk about who should be doing this at your company. 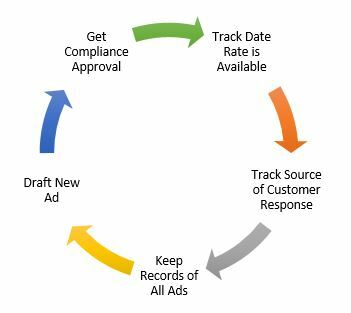 We recommend that you have a person identified whose job it is to track each ad, keep a copy of each ad and also keep records of the time period during which the particular ad was being presented to consumers. That means making notes of the start date and end date that the particular ad was distributed to consumers, regardless of the media type. In addition, your Marketing Person, should have a particular written policy that explains how ads are reviewed by an experienced compliance person or lawyer before the ads are approved to be presented to the public. Moreover, this person should ensure that only recent available rates and offers are used in the ad and are documented with a rate available as of date and a statement that rates are subject to change. In short, your Marketing Policy should reflect all of the rules you follow to make sure your ads are fair to consumers and are properly saved with tracking of dates of use, etc. The more time you spend building and refining these processes, the better you will be in a future examination by a state or federal regulator. And your customers will react more favorably to your ads when you handle them properly and in a fair manner with your customers.